Former Senate candidate Ned Lamont has called for Sen. Richard Blumenthal to vote in favor of the multi-national, nuclear non-proliferation agreement that’s been struck with the government of Iran. All the other members of Connecticut's Washington delegation have voiced support of the deal. 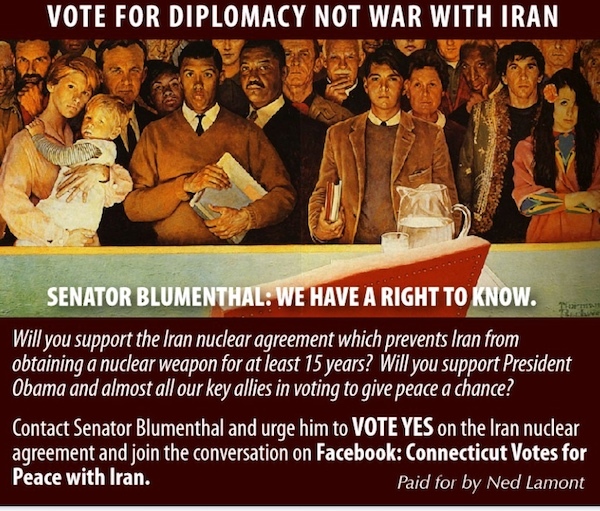 Lamont posted advertisements online urging Sen. Blumenthal, the one holdout, to pledge his support of the agreement. This is obviously a difficult issue for the senator, and according to a story in CT News Junkie, "...the state’s senior senator wouldn’t say whether his Jewish heritage would play a part in his own decision to support or oppose the deal." Not surprisingly, neo-con chickenhawk Joe Lieberman is actively campaigning against the deal. Lieberman has proven himself to be one of the biggest obstacles to a lasting peace in the region, and it doesn't take a political genius to figure out where AIPAC-Joe gets his bread buttered! Lieberman is taking over as the head of an advocacy group, United Against Nuclear Iran (UANI), trying to kill the nuclear deal with Iran after a former executive decided to embrace the agreement. 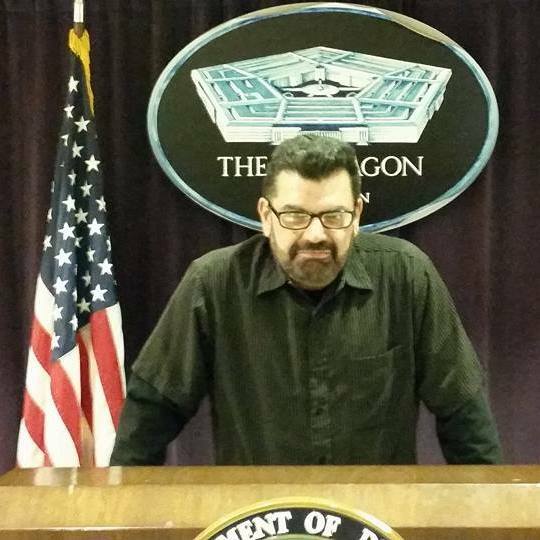 Former group president Gary Samore — the White House’s former top arms control adviser — is being replaced since he does not want to have the agreement blocked. It says something when the head of an organization devoted to killing the deal changes his mind after reading and reflecting on the agreement. It cost him the job, but obviously it was that important to him. Congress is expected to vote on the resolution by September 17th. Also, I'm still STRONGLY in favor of establishing regional primaries, to allow the candidates to visit states in a small area and getting more voters to actually SEE and HEAR the candidates. Divide the nation into four quarters, and have primaries run in February through May over four weeks in each month. Rotate the months so if the Northeast gets February, the next year they go on in May, and each year rotate closer to the top. Within each region the states can work out what weeks they get, and set up a rotation within their region. It's totally fair to everyone, which means it will be opposed by pretty much every state! 1 This date does conflict with the Martin Luther King Day holiday in 2016. As John Deeth points out in the comments section that is an issue that was a source of some discontent among Iowa Democrats when the caucuses and holiday overlapped in 2004. If that is an issue again in 2016, it may affect the date of the caucuses above. Moving it up further would perhaps push the envelope a bit too much, but the state parties may opt to hold the caucuses on a Tuesday -- a week before New Hampshire on January 19 -- as they did in 2012. 2 The state parties in Colorado have the option of choosing either the first Tuesday in March date called for in the statute or moving up to the first Tuesday in February. 3 The North Carolina primary is now scheduled for the Tuesday following the South Carolina primary if the South Carolina contest is prior to March 15. Given the protected status South Carolina enjoys with the national parties, a primary prior to March 15 is a certainty for both parties in the Palmetto state. The link to the North Carolina statute does not yet reflect the change made to the presidential primary law. Language laying out the parameters for the primary can be found in the bill (HB 589) signed into law in summer 2013. 4 The Minnesota state parties must agree on a date on which to hold caucuses by March 1 in the year prior to a presidential election. If no agreement is reached, the caucuses are set for the first Tuesday in February. So, while Minnesota technically had no date until February 14, 2015, and thus no real movement on the calendar, FHQ will include the fact that the Minnesota caucuses date moved back 28 days relative to their position in 2012. 5 The 2011 law granted the primary date setting authority in Florida to a committee for the 2012 cycle. That basically allowed Florida to reset to no date after the presidential primary until the Presidential Preference Primary Date Selection Committee met to set the date for the next subsequent cycle. That law was amended in 2013, eliminating the PPPDSC and setting the date of the Florida presidential primary for the earliest date not penalized by the delegate selection rules of the national parties. That law, too, kept the date of the 2016 primary in doubt. The Republican National Committee has rules penalizing both the timing of a primary and the delegate allocation based on the results of said primary. That, in turn, essentially ceded the decision on the date of the presidential primary to the Republican Party of Florida. If the state party opted for a winner-take-all delegate allocation, then the primary would be on March 15. However, opting into a proportional allocation plan would place the primary on March 1. The Republican Party of Florida had signaled, but not officially set/changed the allocation rules for 2016. As such (because of the PPPDSC reset and the 2013 law not being fully realized before it too was changed), Florida did not technically move any on the calendar (see Minnesota situation above). Yet, based on Florida's position on the last Tuesday in January in 2012, the 2016 primary will be seven weeks later. 6 See definition of "Spring election" for clause dealing with the timing of the presidential primary. 7 The New York primary was moved to April for the 2012 cycle by legislation passed in 2011. That legislation expired at the end of 2012 which brought the New York primary back to February. 8 The Washington presidential primary is scheduled for the fourth Tuesday in May by law. Current legislation would shift that date into March. However, neither state party in Washington has ever committed to using the primary election for the allocation of delegates to the national conventions long term. 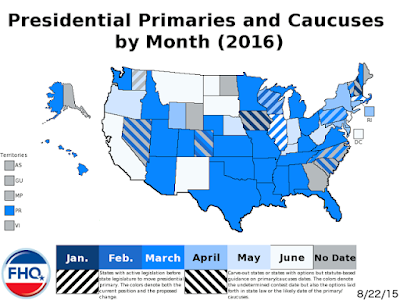 Washington, then, appears on the map as either March or May, but given the uncertainty over whether the parties will adopt the primary or use caucuses, FHQ also includes a gray "No Date" signifier. 9 The Western States Presidential Primary in Utah is scheduled for the first Tuesday in February, but the contest will only be held on that date if the state legislature decides to allocate funds for the primary. If (and only if) there is no Western States Presidential Primary (i.e. : the legislature does not fund the February contest) will the fourth Tuesday in June primary for other offices be an option available to the Utah parties according to the state law. However, the fourth Tuesday in June option is too late to comply with either national party's delegate selection rules for 2016. That would officially force the state parties to adopt a caucuses/convention process on a date of their choosing. 10 Kansas has not held a presidential primary since 1992. Funds have not been appropriated by the legislature for the primary since that time. That said, there are laws in place providing for a presidential preference primary. Assuming funding, the Kansas secretary of state has the option of choosing a date -- on or before November 1 in the year preceding the presidential election -- that either coincides with at least 5 other states' delegate selection events or is on the first Tuesday in April or before. Yes, she's often referred to herself that way. "Runs In The Family" is a track off her 2008 album, "Who Killed Amanda Palmer? ", a play on the mystery of the classic TV show "Twin Peaks", where a major plot point was a murder of character Laura Palmer. Also featured on the album is the always awesome Ben Folds. Runs In The Family addresses the struggle of people with genetic illnesses, whether physical or mental. Although, based on Palmer's frenetic performance, I'd guess she was focusing more on mental illness. Amanda Palmer also happens to be married to famed author Neil Gaiman (...and when are they going to finally make a movie out of "American Gods?"). And she wrote a book called "The Art of Asking", which I recently read and highly recommend, and that led me to watch her memorable TED talk that spawned the book. Very much worth a viewing.